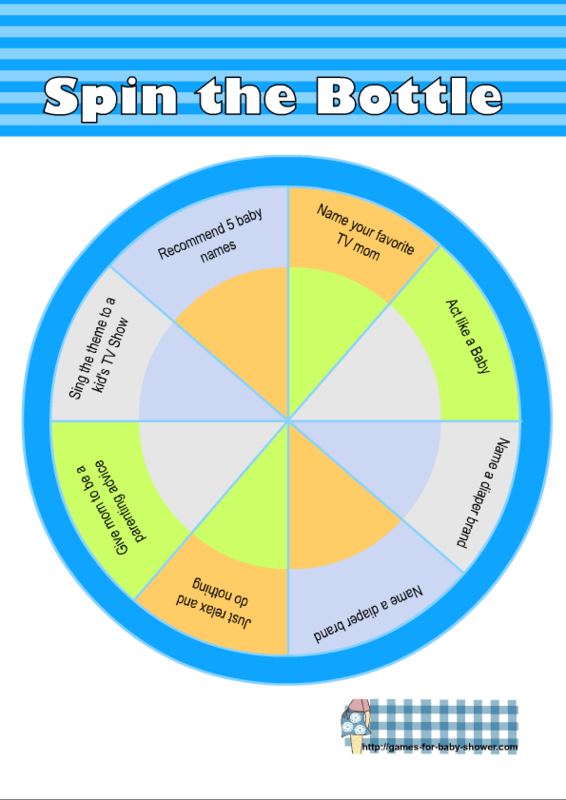 Spin the Bottle is a fun baby shower game. Just like spin the bottle truth or dare game, this game has only some fun dares for your guests. All you need is one printable of this game and a baby milk bottle. I have made free printables for this game in three different, fun and bright colors. You can print this game in a color of your choice. How to Play: Place the Spin the Bottle Game card on a table, or on a carpet. Ask the guests to sit around the table so one dare will be facing one guest. Place a baby milk bottle on the center of this game card and spin it, whoever the bottle will face should compete the dare the bottle will be pointing towards. This is an adorable free printable for this fun baby shower game. This cute printable has a dark pink header and it is perfect for a girl baby shower. Click on the image given above to save the bigger Spin the Bottle game image. This cute game is in blue color and perfect for a boy baby shower. This is another adorable color for this free printable baby shower game. Just click on the thumbnail and save the bigger image or print it right away.